Oh, Danii boy. How quickly fortunes and perceptions can shift in Formula 1. Two weeks ago Daniil Kvyat, who has been unceremoniously dropped by Red Bull, was lauded for standing up to Sebastian Vettel in China as the four-time world champion criticised him in full public view. "Madman", "suicidal" and "torpedo" were just some of the words used by the German in relation to Kvyat, who dived down the inside of the Ferraris while the red cars were busy crashing into each other. A laughing Kvyat responded: "That's racing," and added: "We didn't crash." To which Vettel replied: "You didn't. You were lucky this time." That was not the case at his home race in Russia as Kvyat rear-ended Vettel twice in quick succession, at the second corner and then the third, forcing Vettel into a spin into the barriers and instant retirement. Kvyat was given a 10-second stop-go penalty for his errors but worse - much, much worse - was that this happened right in front of Red Bull motorsport kingmaker Dr Helmut Marko and Russia president Vladimir Putin. And, for Kvyat, the wrath of Dr Marko turned out to be much more serious than embarrassment in front of Putin, as Red Bull have now taken the decision to promote Toro Rosso's Max Verstappen to the senior team and drop Kvyat back to the junior team Toro Rosso with immediate effect - the team with which he made his name in 2014. "We are in the unique position to have all four drivers across Red Bull Racing and Toro Rosso under long-term contracts with Red Bull, so we have the flexibility to move them between the two teams," said Red Bull team boss Christian Horner. "Daniil will be able to continue his development at Toro Rosso, in a team that he is familiar with, giving him the chance to regain his form and show his potential." 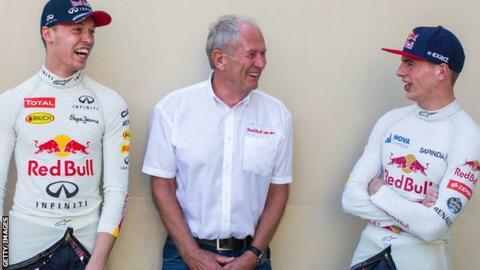 An Austrian, 73-year-old Dr Marko is the head of Red Bull's driver development programme, which supports promising drivers in junior formula with the best progressing to its two Formula 1 teams - Red Bull and Toro Rosso. He was a driver himself and won the Le Mans 24-hour race in 1971 before a brief Formula 1 career was ended a year later at the French Grand Prix when a stone thrown up by Emerson Fittipaldi's Lotus pierced his helmet visor, blinding him in his left eye. Dr Marko is not afraid of bruising egos and has had some blunt words for notable drivers. In January 2013, in the company's own magazine, he said then Red Bull driver Mark Webber "falls relatively easily into a downward spiral" while two-time world champion Fernando Alonso was "busy with politics and funny comments". Last year he also threatened that Red Bull would quit F1 altogether "if we don't have a competitive engine in the near future". Red Bull's motorsport adviser Helmut Marko has a reputation as a ruthless character, and Formula 1 as a sport in the same vein. But the decision to drop swap Daniil Kvyat and Max Verstappen just four races into the season is undoubtedly extreme. Kvyat made two clumsy mistakes in the space of a few hundred metres at the start of Sunday's Russian Grand Prix, both of them involving crashing into the back of Sebastian Vettel's Ferrari. Yet those errors came just two weeks after Kvyat had put Red Bull on the podium for the first and so far only time this year at the Chinese Grand Prix. Has Marko, who runs Red Bull's junior driver programme, really dumped Kvyat on the basis of one poor result? Kvyat has not lived up to expectations. He has shown flashes of promise, undoubtedly, but team-mate Daniel Ricciardo is clearly the quicker driver. This decision, though, is as much about Verstappen as it is Kvyat. The 18-year-old, is the hottest young property in F1. He wowed observers with some of his inspirational and improvisational overtaking moves last season - attracting the attention of Mercedes and Ferrari. Promoting Verstappen to the senior team is as good a way as any of stopping his eyes wandering too much and keeping him in the fold. As ever in F1, the politics and the sport are inextricably wrapped together. Gossip: Not happening in Vegas? Read more on Gossip: Not happening in Vegas?